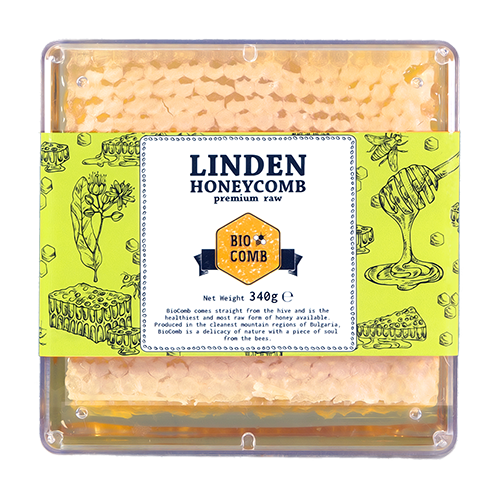 BioComb is harvested from the cleanest mountain regions of Bulgaria, hand cut and boxed with no additional treatment or processing. It is the rawest form of honey available, directly from the honeybee hive. Naturally fat free, cholesterol free, sodium free, and gluten free. BioComb is innovative, delicious and fully natural superfood with all of the natural enzymes, amino acids, pollens, vitamins and minerals. This product is just a delicacy of nature with a piece of soul from the bees. How our honeycombs are made and why they are so unique? Our bees are gently collecting the nectar from the flowers. For a single box of BioComb, the bees visit more than one million flowers. Back in the hive, the bees convert this nectar into honey and store it in wax cells. 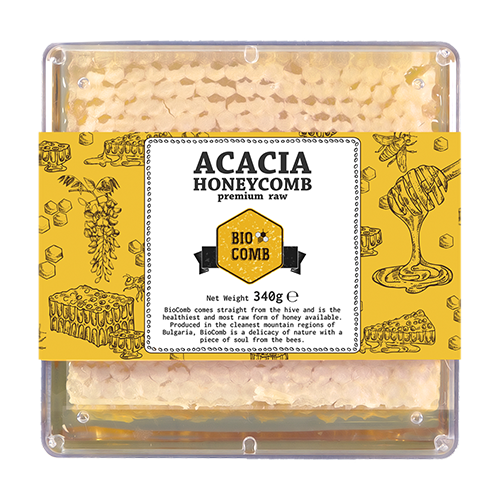 One BioComb contains about 360 wax hexagon cells full of honey. When taken from the hive honeycombs are strictly inspected for any impurities. Impurities such as pollen grains or brood are not accepted in BioComb. Honeycombs that have passed the quality controll are cutted and packed in a box. Cutting is made by hand by а special thermo-controlled cutting device. The final product is stored in special warehouse, ready to be shipped worldwide. Temperature and humidity levels are strictly controlled to preserve BioComb's health and nutritional properties. After the primary selection and quality checking only few cuts of every bee frame taken from the hive become BioComb. That’s why BioComb is produced in limited number of units per year and exported to US, EU, Japan, Canada and more. Do you love eating the most natural food, just as created by mother nature? Providing our customers with products that meet and even exceed their expectations is the key of our business. Being the primary producer allows us to strictly monitor and controll the whole production process to ensure we provide the best possible quality. 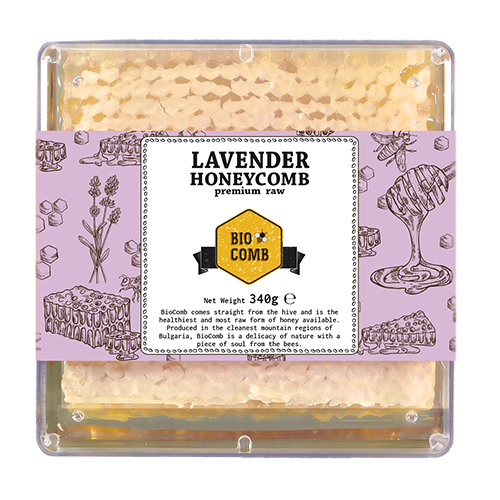 BioComb is made by lovely bees in our own apiaries and packed in a dedicated GMP manufacturing unit. We take serious care and efforts about the quality. That’s why both our apiaries and our manufacturing facility are certified under EC Regulations 834/2007 and 889/2008 for organic farming. The certification of BioComb is provided by SGS - the world’s leading inspection and certification company. We are in the process of certification by USDA too. We carefully select the places to locate our apiaries and choose only places away from cities and industrial pollutants. Besides that every place must meet the EU organic regulations, it should comply with our strict internal policies. Positioning the hives in protected mountain areas and national parks abounding with acacia or lime trees is a mandatory requirement. Every BioComb has a story. Want to see yours? Scan the QR code on your BioComb or enter the 8 digit code. You will be redirected to a special page showing the exact origins of your product and some really interesting information about it. Copyright © 2018 BioComb.com, All Rights Reserved. BioComb is a brand of Pastili Limited.